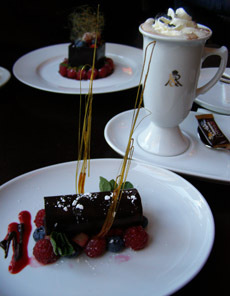 The Schokoladen-Restaurant, the first and only chocolate restaurant in Europe, opened on September 15, 2006, and every dish on the menu contains cacao from Ecuador, Tobago, Trinidad, or Venezuela. Imagine a hot smoked garlic and chocolate soup, fish with cacao butter, or venison with dark chocolate; all is possible at the Schokoladen-Restaurant. 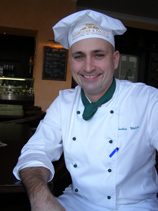 Austrian Chef Markus Walder has worked in Switzerland and in the United Kingdom at The Dorchester, and at many Michelin-star rated restaurants, but it is his first time working as a chef cooking with chocolate and cacao beans. When not creating new chocolate recipes, Chef Markus Walder relaxes by riding his mountain bike in Austria and Switzerland with his wife. 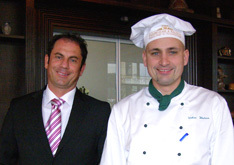 I had lunch at the Schokoladen-Restaurant in March 2007 and met with Chef Markus Walder and General Manager Mr. Stefan Reichl, to get a glimpse into the background of the concept of the unique restaurant. In 1863, Heinrich Fassbender began creating chocolates, in 1890, William Rausch began creating chocolate, and in 1999, the two families joined forces to create Fassbender & Rausch. 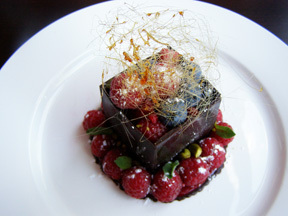 With two such illustrious chocolate houses working together, new ideas came to light, and the creation of the Schokoladen-Restaurant, where they combine old style cooking with cacao beans with healthy cuisine and artistic presentations. The result is pure decadence, and a chocolate lover's dream. Cut the sole filets in thin cubes and marinate in the lemon juice for 2-hours. Cut the dill, and add it to the sole. Pour the juice out from the sole, and then mix the sole with the warm white chocolate. Arrange it nicely on the plate with the smoked salmon. For the sauce: Mix the cream and fish sauce and saffron together, season to taste with salt and pepper. Finish with dill on the top of the plate. 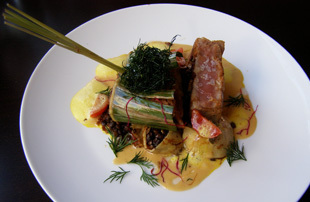 Wrap the banana leaf around the tuna steak. Grill the tuna steak in a hot pan quickly on all sides, until the middle of the tuna is pink. Cook the lentils in warm water without salt. Drain, and add the warm dark chocolate to the lentils, and season with salt and pepper. For the pancakes: Add milk to the flour and mix, and then add the egg, and mix well. Pour the pancake batter in a thin line into a hot pan. When the pancake is golden, flip to cook the other side. Fill the Pancakes with the lentils and roll up. For the sauce: Heat the fish sauce and cream, and finish with butter. 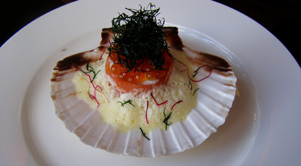 Place it attractively on the plate. Make a batter from the flour, warm milk (not hot), yeast, liquid butter and egg. Then add the chopped chocolate into the batter. Make some small blini. Roast the venison in a pan and then marinate with achiote, quinoa, and chopped cacao beans. 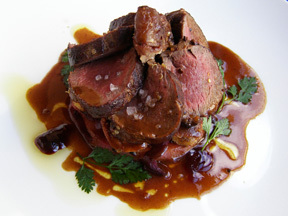 Leave the venison in the oven for approximately 7 minutes in a preheated 180° C (350° F) oven. Place the blini in the middle of the plate and cut the venison in thin slices. Finish with the warm jus, and place some dark chocolate over the meat. Cook the cream with the lemongrass and then let cool overnight. Add the egg yolk, eggs, and powdered sugar, and beat until foamy. Add the gelatine leaves to cold water. Beat the cream until stiff and then mix in the egg yolk mixture. Add the cottage cheese and the gelatine to the mixture. Place the mixture in a small round cylinder, and place it into the freezer. Bring the chocolate to the melting point and dip the cold cylinder into the chocolate. For the red fruit jelly: Cook the red wine and add the cream powder. Add all of the fruit to the hot red wine and cook it only 30 seconds. Add the sugar and then it is finished. Place it on a plate, add the red fruit jelly, and finish with the cannelloni. Beat the butter, egg yolk, and powdered sugar together with the melted arriba chocolate. Beat the egg whites separately with the sugar. Mix the egg white with the chocolate mixture. Add the nuts and the breadcrumbs, and mix. Pour the batter into a buttered baking-tin. Bake it at 170°C (325° F) for 15 minutes. Melt the chocolate and spread on a transparent film. Cool the chocolate and cut into squares. Cut the arriba cake the same size. Marinate the fruit with sugar and mint. Arrange the arriba cake in the middle of the plate and fill it with the fruit. Read about in Schokladen-Restaurant the Restaurants section.